Enhance customer service, Offer promotions, and strengthen your brand � before, during or after guests visit. Promote and sell offers to guests via Facebook Messenger, TXT, and Web chat. Deliver timely information to guests via mobile - before, during and after their visit. Immediate answers for guests. Powered by AI technology. Guests ask or speak questions. Answers delivered in text, graphical, or HTML format. Keep guests updated about special offers, events, and weather. Complements your existing Social Media Marketing tools. Campaigns easily created and managed within Patio console. Automatically synchronize content from your Facebook pages. 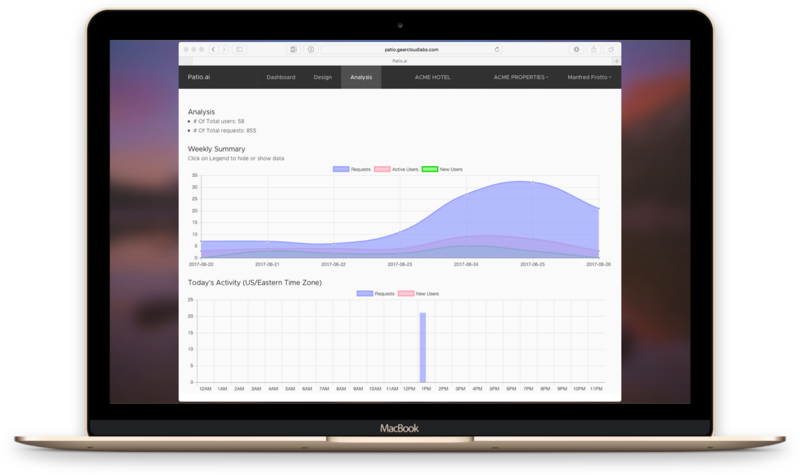 Track & Optimize your campaigns. Start chatting now with our demonstration assistant. Or sign up for a guided demonstration or quote.